Visit any tourist spot, sunset point or a beach, which is on the western coastal side of any country, we will find lots of people taking photographs of the sunset. Sunset, most of the time, is dramatic and colorful, especially when there are few high clouds in the sky. At sunset time, these clouds receive the sunlight, even after the sun goes down the horizon, and show some astonishing colors. However, have you noticed one thing? The moment the sun is vanished below the horizon, most of people pack up their cameras! Even after the sun is below the horizon, there is enough light which should be captured and photographed. This twilight is sometimes more beautiful as compared to the time, when the sun is above the horizon and in the frame. When the sun is still above the horizon, it will create a huge impact on the composition, but when it is hidden, colors in the sky will play major role. This light remains for long period. Duration depends on the geographical location of the place and season. A place, which is closer to the equator has less time, about fifteen to twenty minutes. As we move towards the north (in northern hemisphere), the time increases. Explore this arena of glory of twilight to its maximum. Silhouetted images are more dramatic during this time and atmosphere itself is communicating. The sky is full of colors as it reflects the sunlight, which we cannot see because of the curvature of the surface of the earth. As the sun further goes down, early stars appear, even if there is some light left. This beauty of the nature must be photographed, for a natural landscape, seascape or urban landscape. 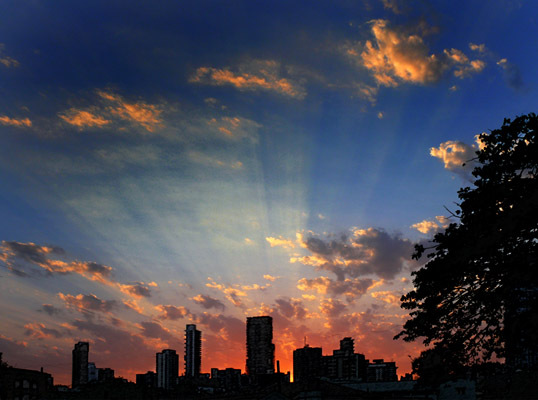 At this time lapse, urban landscape has a unique look for sky light showing its colors and skyscrapers, showing their lights. This effect changes its balance and as time passes, the effect moves towards engineering from nature, till the genre of photography becomes night photography. As the light becomes less, we may require a tripod, or we can rest the camera on some rigid support. We can also select higher ISO to get faster shutter speeds, but avoid it as 'noise' in the photograph will increase. Camera on a tripod will allow us to shoot at smaller aperture and lower ISO. However, longer shutter speeds beyond five seconds will record the movement of clouds, as they are drifting along with the wind. So compromise with aperture and remain within the range of shutter speed, not exceeding beyond five seconds. Faster lens is a good option, if we have one or we may have to go for higher ISO. Silhouetted images are most dramatic during this period. Any obviously known figure conveys full story even if it has no frontal details. A child playing in sand or a couple walking away from the camera are some of the good examples of how a tranquil mood can be created without revealing any detail in the main subject, and only negative space in the photograph is playing main role.